Welcome to my kennel of Bonsai Miniature Bull Terriers. Here you can find information about the Miniature Bull Terrier breed, its performance, health, finding a puppy, and membership in the nationwide Miniature Bull Terrier Club of America. The MBTCA was originally created by a dedicated group of breeders and owners interested in expanding their knowledge and appreciation of the extraordinary qualities of this breed. 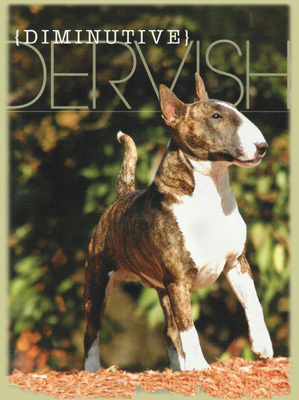 Membership is open to fanciers who are interested in exhibiting at AKC dog shows and/or performance events, and those who support breeding healthy Miniature Bull Terriers who fit the standard. It is also open to those who simply love the breed and seek friendship with fellow fanciers. To apply for membership in the MBTA, click HERE or use the button to the left. While you are here, check out the vast amount of information under BREED INFO or look through my PHOTO GALLERY to see my dogs and their pedigrees or view their AWARDS page. Also feel free to take a moment and leave your comments in my GUESTBOOK! • There used to be three types of Bull Terrier: Toy, Miniature and Standard! All rights reserved. For more information, please contact us above.